MY FIRST AWARD!!! HURRAY!!! 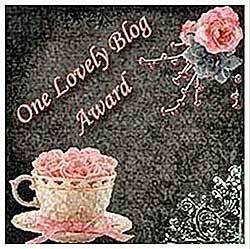 My blog has been awarded the lovely blog award by not one, not two but by three lovely ladies. Thankyou, Jay, vasavi and Akila for this lovely gesture. I will always cherish this award. I could not accept this awrd as I was awee bit busy/ lazy :) so I apologize for that. Now comes the difficult part of sharing this award with 15 others. Choosing 15 people among so many other creative people is such a daunting task. It took me more than 30 mins to come up with this list. Congrats dear, keep rocking..Thanks for sharing with me.. The firsts in our life always hold a special place. Congrats on your first blog award dear, well deserved.. and thanks a lot for sharing it with me..am honored! Congrats and thanks a lot for sharing! madam, i guess u forgot to share this award with the 3 most imp women in ur life. hw cud u have forgotten them? i guess some of d recipes was inspired by them. Congrats on your first award! Well deserved! Congrats on your first award.Wish your many more and thanks for sharing this with me. I am new to blogging.Do i need to accept this award and pass it on to other?